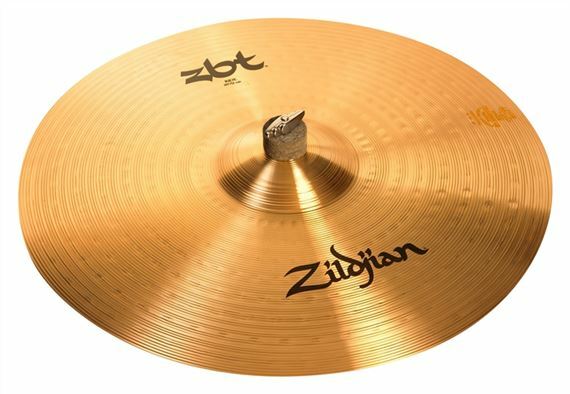 Order your Zildjian ZBT Ride Cymbal from AMS and enjoy 0% Interest Payment Plans, Free Shipping, Free Extended Warranty & 45 Day Money Back Guarantee. Start Here. Go Anywhere. Don't let price stand between you and a sensational sounding set of cymbals. Revolutionary new manufacturing techniques developed by the Zildjian Sound Lab release a fast, bright, high-volume sound from the power-packed ZBT alloy. They make an ideal first set of Zildjians for any school marching and concert band. Bright: Intense, high-pitched sound cuts through the mix of other instruments. Loud: Sheet origin and lathing techniques create high-volume projection. Fast: Speaks quickly and brightly when struck then decays rapidly. Consistent: Pressed and lathed from sheets of uniform, high-quality bronze alloy. Great Value: Manufacturing innovation delivers Zildjian quality at affordable prices. Brilliant: Sold exclusively in the highly polished, brilliant finish. The Ride cymbal is an integral part of every cymbal set-up, from acoustic jazz to heavy rock. When the High Hat takes the role of timekeeper, the Ride is free to become the drummer's most personalized means of self-expression. The clear, well-defined sound, along with its flexibility to voice both riding and accents, opens up unlimited possibilities for the drummer. There are two basic types of Ride cymbal. One type has fewer overtones and extreme stick definition, while the other has good stick definition as well as plenty of spread with more overtones. Zildjian offers both of these extremes and everything between, to give you every possible choice. The hallmark of a great Ride is the consistent balance between stick attack and overtones at any dynamic level. This 22’ zildjian. Gave me just the right pitch I’ve Ben looking for it really has open the door for. A whole knew creative sound thanks AMS! Nice cymbal and smooth transaction. Very pleased!